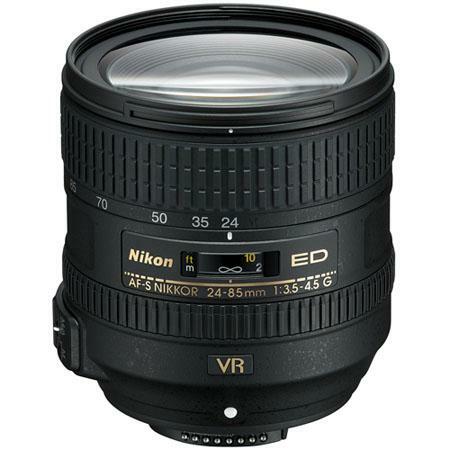 Another of Nikon’s 24-85mm wide zoom lenses, the AF-S NIKKOR 24-85mm f/3.5-4.5G ED VR has one particular feature that hand-held shooters would love to have and that is VR (Nikon’s take at optical image stabilization). Nikon’s second generation VR II (Vibration Reduction II) technology allows up to four stops of slower shutter speeds than it would otherwise be possible when shooting hand held. This lens is designed to fit into the segment of a wide angle to medium range telephoto and the presence of VR means handheld shooting in landscape, architecture and even portraiture is all the more easier. The maximum f/stop that is achievable when fully zoomed out is f/3.5 and the minimum f/stop is f/22 – f/29 between 24mm and 85mm. 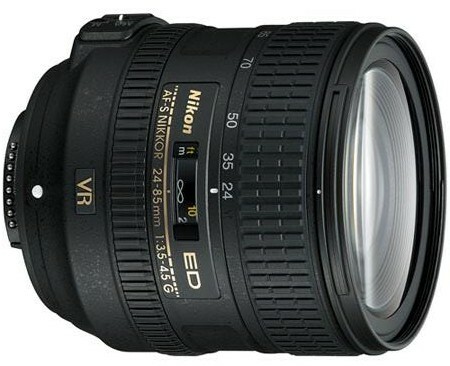 Nikon has provided SWM (Silent Wave Motor) technology in this lens which ensures that the lens focuses very quietly when shooting stills or HD videos. The presence of M/A (Auto to Manual override) allows for easy manual focusing even when the lens is trying to auto-focus. The presence of SIC (Super Integrated Coating) ensures that lens flares and ghosting is suppressed even when shooting full wide in broad daylight. Again AS (Aspherical Elements) in the lens ensures that the lens can eliminate Spherical aberrations. Internal Focusing (IF) elements ensure that the lens never protrudes when focusing, which keeps the lens length constant. Diameter x length(distance from camera lens mount flange) Approximately 78 x 82 mm/3.1 x 3.2 in.